The Sales Manager as the Greatest Revenue Multiplier (Chap. 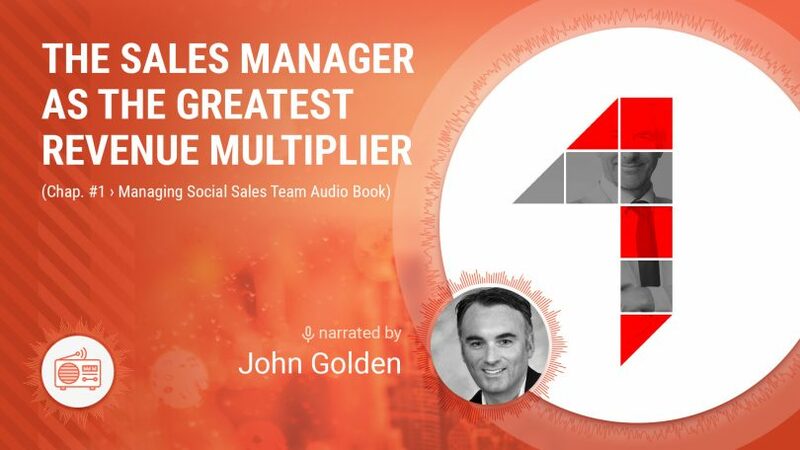 1 Managing Social Sales Team Audio Book) by John Golden - SalesPOP! Social selling is not something that should be left to chance or allowed to grow without structure inside a sales organization. Rather it needs to be actively managed and treated strategically — and it’s the sales manager who needs to play the central role in ensuring that social selling activities are understood, adapted, adopted, and executed in the right way. The sales manager who does this can become an organization’s greatest revenue multiplier rather than someone who oversees a sales organization that becomes outdated and ineffective. Listen to this first chapter narrated by John Golden to learn more.